Lori-Ann Murphy has a job that I would consider killing for. Not really… well… maybe… depends who is asking I guess. She is the Director of Fishing at El Pescador Lodge in Belize. She didn’t luck into it though (which is the only way I’d get that kind of job). She was the first female Orvis endorsed guide. She’s been a guide for 21 years. She splits time in Montana and Belize… basically places with fish. She founded Reel Women, which I’ll try to tell my wife about in the vain hope she’ll desire to cast a fly some day. 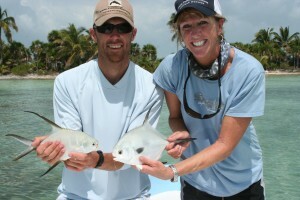 Lori-Ann with Wil Flack and a couple little permit (although one may be a pamoleta). Double Date. Lori-Ann called all the way from Belize for this interview, which my three year old daughter crashed at least twice. Thanks Lori-Ann. Your title is “Director of Fishing.” What does that entail there at El Pescador Lodge? I’m a liaison between the guests and the guides. Today I’m going to do a fishing orientation… I bring a big map and show everyone where we are and I tell everyone about the lagoon in the back and all the fishing they can do around here on their own and what the guided experience is all about and get them ready for that. I look over their flies. We have a full quiver of fly rods here, 8-12 wt, so if they need to be outfitted with one of our fly rods I’ll take care of that. In the morning I introduce everyone to their guides and explain the day. I work with the guides. I have a great team of 11 that I love to pieces. The day before yesterday I had a guide meeting. I’m also a nurse, so when I first came here in November they were asking why we were having all these meetings, and I said “I’m a nurse, we have meetings.” We have monthly meetings with the guides to discuss all the things that come up, guest relations to environment to whatever the current thing we might be doing is. For the people that come out to El Pescador, where to you think their expectations are compared to the reality of the experience? I’m amazed that beginner saltwater angles come here and say “I want to get a Permit” and they do. El Pescador is a great place for beginners because we have a bagillion bonefish and while they might not be as big as the Bahamas, but they are all hot fish, 2-6 pounds… a 6-8 fish is huge. I was just reading an evaluation from a beginner and he was fully expecting, as a beginner, to land a grand slam. I think people probably have been reading too many magazines and watching too many TV shows and some people are quickly humbled in the salt. I usually do daily casting lessons at 4:30 on how to have an efficient cast and how to pick it up and shoot it and how to change the speed of your haul and all that stuff. Expectations are all over the map. Generally, people come here with really high expectations and it works, somehow. It seems Ambergris has become very popular. I’ve seen the Currents of Belize and my overall impression is that there is a lot of development and that over-development is either happening or about to happen. What’s your impression being down there? Wil Flack and all the guys who did Currents of Belize, those guys are all my friends. Twenty years ago it was a small fishing village. Ten years ago it really changed. The government was able to sell land and when you sell land people were also able to dredge up the flats. So that’s been going on a lot. A lot of my time in Belize was in the 90’s and that wasn’t happening. Allie, the owner here dedicates 20% of her time trying to preserve the land around here so we can keep the mangroves intact, keep the flats intact so we have a sustainable fishery for future generations. That’s a really big discussion down here. There’s Green Reef and other organizations that are trying to do good things. Allie had investors buying land. Leonardo DiCaprio bought a Cay, Black Door Cay, and Allie bought four small keys to preserve and put it in a land trust. We hope to see more of that. The San Pedranos here have seen SO much change in the last 20 years. At first it was wonderful since people went from a small fishing village to actually having some money. The guides here make a lot of money, between $60K and $100K. We’ve all seen a lot of change. There is a huge push to keep Ambergris from just getting sold right off. I was a big fan of Pirates of the Flats and have been watching the news coming out about Buccaneers and Bones. What was it like to be part of that project? I was really flattered. It was a lot of fun. I had that week off my regular responsibilities because I was involved in the fishing and filming end of it. It was great to get to know the whole crew. Of course, Tom Brokaw, Michael Keaton, Tom McGuane, they all have a place up on the Bolder River in Montana and I live close to there (I live here for 9 months and in Montana the other 3). That Montana connection was wonderful and being able to see the passion and commitment from Yvon Chouinard. Tom Brokaw would say something, we were talking about the oil spill and he said “We have to stop calling it an oil spill because it is a catastrophe and it will affect our lives for our future.” All off a sudden you realize that is Tom Brokaw speaking there and he’s had his foot on every place on the planet. Michael Keaton was really passionate and really fun… pumped up and excited to be part of things. We had that tropical depression Alex come in and that was interesting. Everyone bolted out of here a day early. Going to Florida, Stu Apte has been a friend of mine but I’ve never been able to fish with him before, so that was quite an honor to be tarpon fishing and hanging out with Stu Apte. I hadn’t met Jerry Alt. Being able to hear those guys talk and be right there at the ground level talking about tarpon migration and data and being a part of tagging fish, both bonefish and tarpon. It was fantastic. I had a nervous breakdown in Florida over a tarpon, so I can’t wait for that episode. El Pescador, Ally and the crew really work as a team around here and it was such a big production. We had guests here too… it was a big deal. What’s your go-to rod and reel right now? Jerry Siem is one of my very dear friends and I’m very fortunate to fish Sage Rods and Reels. I also fish Hatch Reels, I have a few Tibors and I like those as well. My favorite rod right now is the Xi3 7 wt. You throw a 7 because the bones are a little smaller there? I just love this rod. I just love the action of it. 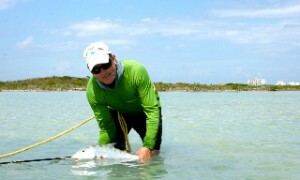 The bonefish are smaller here so you don’t need to throw a whole lot of line. Today I went down to 16 pound because I saw some Permit, didn’t get them, but it sure was fun. I have Xi3’s in 7, 8, 9 and 11. When you are out on the water a lot you see things that others just don’t see. Do you have any stories of things you’ve seen by virtue of being out there on the water as much as you are? Sure, I have two stories right off the bat. 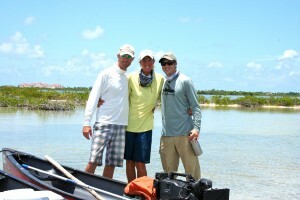 One, I was fishing with my friend Wil Flack and we were bonefishing out in the lagoon out back, which is stellar. We canoed out and then got out to wade this little bay. It’s a muddy bay and we were both up to our knees in mud. We were on opposite sides of the bay. We were probably 200 yards apart. I saw a 7 foot long dark thing come right in between us from the mangroves. I’m thinking “Tarpon!” I can’t wait to see the big tarpon back. I’ve seen lots of baby tarpon, but I’m thinking I’m seeing big tarpon. I cast to this thing (I had a bonefish fly on, but my nature instinct is just to cast) I give this thing a cranial and it stops. I’m yelling to Wil and he’s just so focused because he has a ton of bonefish in front of him. He looks up and the thing gets sideways and the tail goes “wahwahwah.” He yells “That’s a Croc!” We didn’t move. At the end of the day we were talking about it and said “I’ve never waded with a Croc before.” At the time we were just in such bonefish fever we didn’t want to give it up. We had waves of bonefish coming at us. This Croc just swam right between us and just left. We continued fishing all day and didn’t really think about it until the end of the day. Another time we were out there fishing with Wil and Paulie, these guys are steelhead guides up on the Sustut, and Paulie is out there catching his first bonefish. We turn around and this Frigatebird (Frigatebirds can’t land in the water, they can’t take off and die if they land in the water) nearly turns itself inside out and nails about a 3 pound bonefish and flies off with it. I’ve been fishing since ’92 and I’ve never seen that. This entry was posted on Tuesday, August 24th, 2010 at 1:03 am	and is filed under Conservation, Fish Tails, Gear, Locations. You can follow any comments to this entry through the RSS 2.0 feed. You can leave a comment, or trackback from your own site. Reading LA’s interview is almost as good as fishing with her…almost!